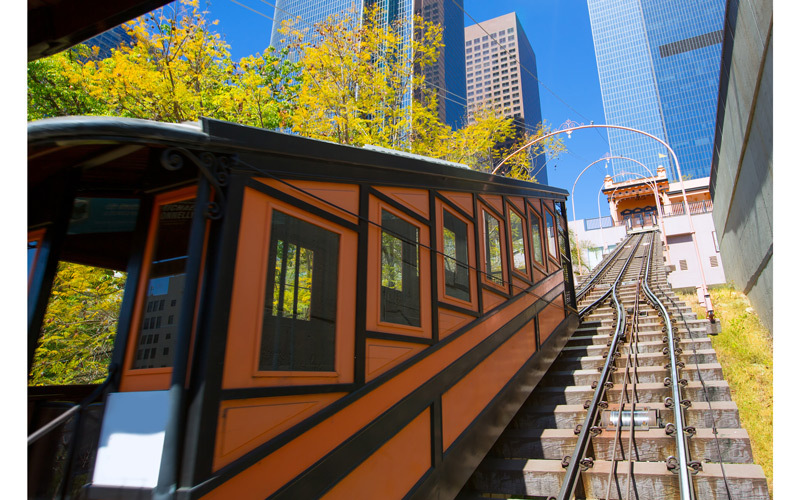 Today marks the long-anticipated reopening of Angels Flight, the historic downtown funicular closed in 2013 over safety concerns. The “world’s shortest railway” has been rebuilt with an emergency staircase and is covered in a fresh coat of orange paint. With Angelenos jumping for joy over the return of Angels Flight, one imagines the happiness other vertical trains would bring to the city. Here are a few L.A.-area spots that would benefit from getting in on the fun(-icular). We all know Dodger Stadium is ridiculously impossible to access—most folks must either brave crushing traffic or trudge up Vin Scully Avenue to catch a whiff of a Dodger dog. Imagine a funicular that took off from Sunset Boulevard and dropped fans off near the main entrance? There’s a perfect spot for the Sunset station—an empty plot on the south side of the iconic boulevard—and the stadium parking lot is 260 acres, so there should be more than enough room for a stop on top of Chavez Ravine. This railway may be more of a gondola, but we’ll take what we can get. Crossing PCH from the Santa Monica bluffs to the beach below is an only-in-L.A. experience. But it’s also kind of gross; those pedestrian bridges are old, rickety, ugly, and usually littered with trash. Once over PCH, you’re often dropped in a dusty parking lot with cars whizzing at your back. A funicular connecting Palisades Park to the beach below would be an absolute hit with tourists and would probably pay for itself if Metro, or whoever operates it, jacks up the price. When Metro was designing the Red Line subway, there were initial plans for a Hollywood Bowl stop. As we know, that did not come to fruition. Other than driving or busing through the insanity that is Cahuenga or Highland on bowl night, one can also brave the long, hot walk from the Hollywood/Highland subway station up to the music venue. How about knocking down one of the stripmalls or gas stations located north of the Hollywood/Highland center and throwing up a funicular station? The folks who still walk up to the Bowl will appreciate the shade provided by the train’s tracks and support beams. This would likely be more akin to a ski-lift or gondola, but a connection from the La Brea or La Cienega Expo Line stations to beautiful, and inaccessible, Kenneth Hahn State Recreation Area would be much appreciated. As it stands now, it’s quite difficult to walk to this scenic spot—there’s a pedestrian entrance at La Brea and Stocker Street—but a train or lift up the steep hill would open this park up to thousands more Angelenos, especially folks who don’t want to pay the $6 parking fee.